2:15 AM high 2.8 ft.
8:43 AM low 0.6 ft.
2:22 PM high 2.9 ft.
9:38 PM low 0.6 ft.
How to reach: To reach the tidal bench marks from where I-395 northbound splits, travel 1.0 km (0.7 mi) along I-395 northbound to the Maine Avenue S.W. exit. Take the Maine Avenue SW exit road for 0.3 km (0.2 mi) until it dead ends into Water Street S.W. Turn SE onto Water Street, S.W. and proceed to the end of Water Street to the Police and Fire Harbor Patrol Office at Pier 5. The bench marks are located along Water Street, Maine Avenue, and Pier 5. 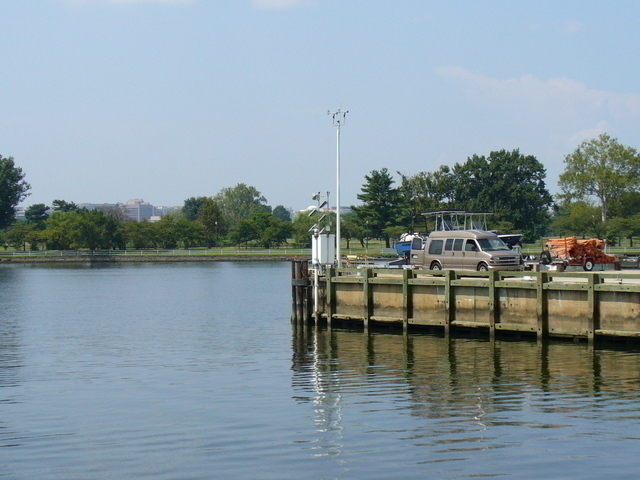 The tide station is located at the SW end of the pier.